This weekend we have been to a 50th anniversary celebration at my childhood church in my hometown. I was in the Girls Brigade for 13 years(aged 5-18! ), not always through choice (and I did get expelled on one occasion) but still quite an achievement. Anyway, this weekend was a rose-tinted look back with a film and lots of photo albums, plus a good deal of yummy buffet food thrown in for good measure. It was nice to catch up with a few old friends and lots of people who you vaguely recognise but who seem to know you really well! 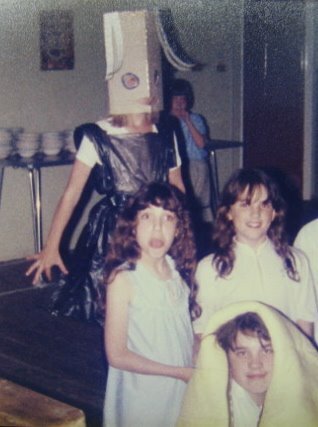 There wern't too many strange photos of me, but I thought I would show the above one, taken on a Girls Brigade camp when I was about 7 or 8 years old, I am the one sticking my tongue out. It is quite a bizarre photo, I dont know what is going on, I am wearing my nightie. The girl standing next to me is my best friend at the time, Jane, we looked quite similar and people always thought we were sisters, which we liked. she was actually a year younger than me but looked older. This was also the camp where I instigated the rule that as we had a bowl of jam (for some unknown reason) on our tables every mealtime, we should put Jam on everything we ate. Of course everyone followed my instruction, much to the horror of our leaders. We kept it up all week, you would be surprised how well Jam goes with lettuce, or chips!! Oh wow, that picture of you looks really strange hannah. Your hair is still the same, but your face kinda doesn't look like you,but does if you know what I mean!! !